Strap N' Guard® is a great way to bring old bras to live as well as being able to change the way you wear your straps to match the shirts you are wearing. No more rolling tube tops, or strapless dresses. There are so many designs to choose from check out their site for many options. My daughter will love being able to wear her favorite shirts without hearing from me you can still see your bra straps. Happy mommy means happy daughter. Great for casual and special occasions. 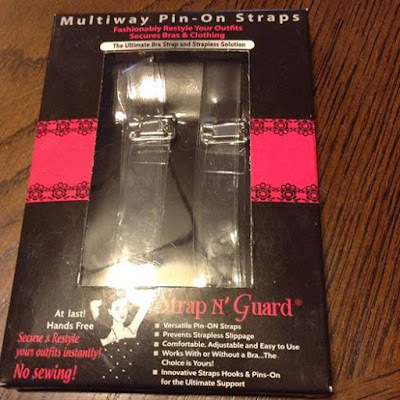 This can be used with the pin, or with the clip if your bras have that option. Strap N' Guard® can be found on Amazon and on their website. What Strap N' Guard® has to say about their product. Disclosure: MarksvilleandMe received one or more of the products mentioned above as part of a promotion with Tomoson and Strap N' Guard®. Regardless, MarksvilleandMe only recommends products or services we use personally and believe will be good for our readers. Some of the links in the article may be “affiliate links.” This means if you click on the link and purchase the item, I will receive compensation. If you would like MarksvilleandMe to review a product or service please contact us at marksvilleandme@gmail.com.